As an Edmonton based writer on this site I have been selected to be the unfortunate jackass who has to try and get inside Peter Chiarelli’s head and come up with who he’d draft. As a life long Vegas Golden Knights fan, I’m disappointed I wasn’t given the opportunity to pick for them, but hopefully on the strength of my picks, Tom will let me have that honour next season. The Oilers are in a very interesting situation, since rebooting their scouting department they’ve been able to build goaltending depth (Wells & Svoboda are both solid options), they’ve built a very respectable collection of defencemen with Caleb Jones, Ethan Bear, Filip Berglund, Matthew Cairns, and Markus Niemelainen, and now they are back in the situation where they need to add to their forward depth again. Anyway, here are the picks. They are very good. Grant Mismash, center from the US National Team Development Program. Mismash may be a bit of a reach with this pick, but his physical play combined with his offence should make him appealing to Peter Chiarelli. The fact that he’s committed to the University of North Dakota that has been a good source of talent for the Oilers is probably a plus as well. In a perfect world the Oilers might try to trade down a bit to make this pick and possibly attempt to recoup their lost 2nd round pick along the way. Noel Hoefenmayer, defenseman from the Ottawa 67s. 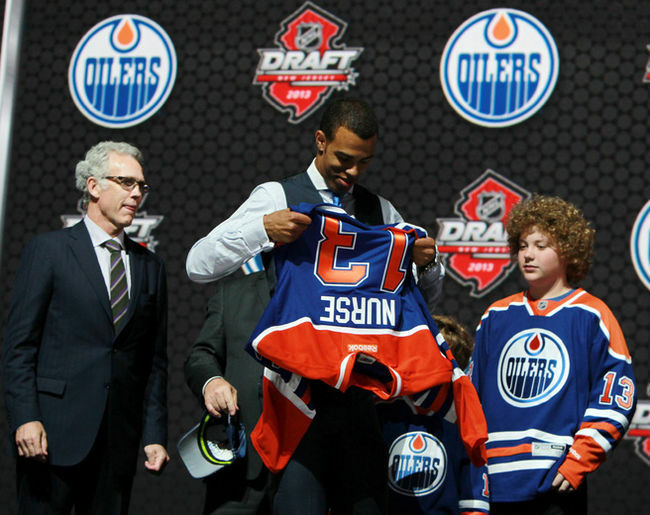 The Oilers have built a lot of depth in their defensive prospect pool, but ignoring the position again could put them back in a hole relatively quickly. Also consider that Hoefenmayer is pretty darn good, with an awesome name. He improved his point total by 35 (to 40) in his second OHL season, and was over a point per game in Ottawa’s brief playoff stint. Filip Westerlund, defenseman from Frolunda. Yes, another defenseman, but Filip has a right shot so he’s different and potentially very much in demand for the way he shoots. Playing against men in the SHL is a definite plus, but significantly waters down his stats, but whenever I see a Swedish defenseman described as a calm puck controller, I assume he’s worth having in the system. Igor Shvyryov, center from Metallurg Magnitogorsk. Neither the Oilers, nor Peter Chiarelli have a promising track record with Russians, but Shvyryov’s offense is hard to ignore. He’s still being held pointless in the KHL, where I’d imagine he’s getting about the same amount of ice time as I’m getting, but in the MHL he’s a 1.13 ppg over his entire career, and this year he’s a 1.75 ppg player. It’s worth noting that Shvyryov was draft eligible last season, but with a late birthday, it’s still impressive that he put up the numbers he did as an 18 year old. By the 4th round you’re at the point where you’re taking chances, and this is a chance I’d take any day. Stephen Dhillon, goaltender from the Niagara Ice Dogs. I am a firm believer in always taking a goaltender every draft. I’m in favour of doing this knowing that the majority of them will not pan out, and there is a finite amount of space for them in any given organization. Cam Talbot isn’t that young, there isn’t a reasonable backup option in place at the moment, and with the exception of Svoboda and Wells, the Oilers could probably cut every non-Talbot goalie from their system tomorrow without regret. Dhillon has put up solid numbers on a less than great team. He’s handled the workload the entire way, and that should not be something teams overlook when selecting a future goaltender for an organization. He’s a big fella, and that seems to be way goaltending is going for the foreseeable future. Philip Lagunov, center from the Burlington Cougars. Project players are fun in the late rounds, and Lagunov looks like he’s going to be joining a good program at UMass that is going to be playing a lot of freshmen. Along with Cale Makar and Mario Ferraro, Lagunov will be joining the team next season and four years of being on a competitive NCAA team might mold him into a promising center for the Oilers down the line. Lagunov has been a point per game player his entire time in Burlington and could be a worthwhile gamble for the Oilers to take when they are thin up the middle as far as prospects go. From the makers of Tage Thompson, comes Tyce Thompson. Where Tage is 6’5, Tyce is 5’10. Where Tage was a 1st rounder, Tyce is just hoping to hear his name called. Look, it’s the sixth round, and I’m not going to pretend that I’m going off of anything other than it’s clear that Brent Thompson and Tage Thompson mean there’s some hope for Tyce. He’ll be a project in Providence, and the fact that his brother is 6’5 gives some hope that a growth spurt is possible. He’s been a ppg player in high school, which probably doesn’t mean much. In reality, I’d probably use this pick on the guy who was projected to go in the second round but is suspiciously still on the board right now. You’re guess is as good as mine on who that will be. He’s 5’7 and that’s gonna count against him a lot, but probably not as much as the fact he weighs 151 lbs. That being said, kids grow, and even if they don’t, taking a late birthday player with 27 goals and 57 points in the 7th round isn’t bad at all. He could potentially do three more years of junior if needed, and that’s not a bad luxury to have on a late pick and he’ll be developing under a coach who was at least worth a look in the NHL. If he had the size, he’d be going at least two rounds earlier.